Let's get the Dredd over and done with. We concluded the Damned Ranger story and thank The Maker we did. I got fed up with the Ranger Chief trying to kill himself and kept wishing he would just get on with it so he'd shut up about it. The story seemed stilted, like Wagner was trying to cram 10 episodes worth of action into 1. Didn't like the ending - glad it's over and we start again next issue. And if I never see those weird looking spaceships again it will be too soon! And now for something completely different. Because it was very good. Young Middenface finished and it ended very well. Although perhaps the sheep in the story might disagree ;-) Anyway, I mourn the loss of this story and hope to see the character return soon. There is plenty of mileage in his adventuring yet. I would like to see more of the Kreelers as we didn't get to see them much. The Kreelers would seem to be the 'norms', i.e. the non-mutants, who are intent on wiping out the muties. Hopefully this strip will return soon. Black Siddha continued to intrigue. Rohan and his friend/enemy Rak finally do battle, but what will happen to our hero. Nothing has happened to change my view of this strip, I like it and I like the artwork. Looking forward to the next instalment. 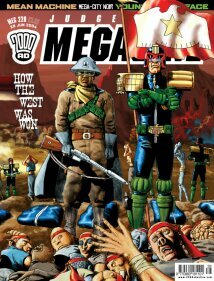 A new single episode strip called Mega-City Noir caught my eye in this Meg. It features a character called Jack Point, or The Simping Detective, an undercover Judge who makes operates as a private eye. This episode was called Gumshoe and featured Point helping out a lady in distress. I like the nod to old 30's American detective movies, as I loved watching those during the school holidays when I was a kid. A Simp, by the way, is Mega City slang for someone who dresses strangely, usually a clowns costume I think, as Jack does. Why? As Jack puts it "Because my shrink says I need to lighten up". Great story from Si Spurrier, lovely Frazer Irving artwork and I hope we see this character in the Meg again. I'm pretty sure he turns up in the Trifecta story arc from recent times, but as I won't get my TPB for another couple of days cannot confirm this. Into the reprints and Charley's War continues to please, and challenge and inform as well. Charley and his mate Weeper are on punishment duty and are finding it tough going. Episode after episode this continues to stay in top form. I'm also enjoying Hell Trekkers, where the challenges for the brave pioneers keep coming and getting worse all the time. Wagner and Grant manage to bring a real human element to this story. All the characters are different, have different hopes and dreams and different skills and qualities. With 111 people at the start of the trek they must have had to plan this story pretty thoroughly and it shows through the quality writing. The art also continues to match the story in its quality. I'm not really into the Metro Dredds. I find them a bit dull and don't really like the art. Text articles had The Dredd Files (oh when will they end...) and Gordon Rennie venting his spleen over the portrayal of religion in 2000 AD. I was left wondering why Christianity always bore the brunt of religious bashing, and I don't think the article really addressed this properly. And finally...Deddlines' best friend Floyd was back with his views on the Meg. And Rod Henley agrees with me on The Dredd Files. Anyone out there enjoy this series?